Two enterprising musicians are using the new technologies of the internet to promote traditional Celtic tunes. 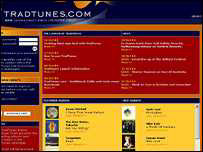 John-Angus Smith and Alasdair MacCuish have created a website, TradTunes.com, where people can download more than 10,000 music tracks. The pair felt that established internet music download sites had failed to offer Celtic fans a wide enough range. Recordings are available from acts such as Capercaillie, the Peatbog Faeries and the Finlay MacDonald band. 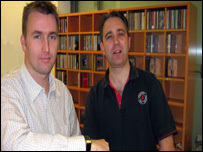 Alasdair and John-Angus, who run Uist Media Group, said most people associated downloaded web music with rap, hip-hop or the latest hits in the pop chart. But with the growing interest in traditional Scottish and Irish music, both in Europe and particularly North America, they believed there was a gap in the online market. Alasdair, a former Scottish accordion champion, said: "Music is now in the digital age and we recognised that none of the bigger music download companies were catering for the traditional, Celtic and roots music markets." Outside Scotland, the biggest following for the genre is North America, so to spread the word stateside the company has recruited Alan Kennedy who has marketed international acts such as Rod Stewart . He said: "This is the inevitable melding of current and growing technology with tradition and heritage and culture. "The truth is traditional music from the British isles is popular in the US and Canada and will continue to be popular and this is the way people are choosing to buy music. "We believe there is a huge untapped potential among fans of traditional style music that can now access the internet and are looking for ways to hear their favourite sounds." Donald Shaw, a member of one of Scotland's leading bands Capecaillie, is backing the site, which he believes will benefit all Scottish and Celtic traditional music. Donald said: "There are download sites, but if you take the obvious one, iTunes, which has a million downloads a month, there is very little in the way of niche music. "This is a big undertaking, because particularly now there is a huge renaissance of traditional music in this country and Ireland, there is a huge catalogue that people are trying to add to their playlist. I think it will be a very strong site." So far, 25 key international traditional music labels have signed up to the site from Europe and North America. Alasdair and John-Angus' company is based at the Hillington innovation centre in Glasgow where they are supported by Scottish Enterprise Renfrewshire. Lorraine McMillan, chief executive of Scottish Enterprise Renfrewshire, said: "This is a terrific business idea and a very imaginative way of using the latest in new technology to highlight the very best of traditional music. "I am very pleased we've been able to help Uist Music Group to get their idea on air and am sure they will enjoy great success."